This week we are reviewing the Chimney Snuffer. Lieutenant Matt Warren and the crew from Engine 14 of the Stafford County (Virginia) Fire & Rescue Dept. tried it out and reported back with their findings. We were provided with the Chimney Snuffer kit to try out, but unfortunately it was after winter time and no chimney fires are occurring now to field test it. Also, you cannot create a practice chimney fire, so we had to be content with performing hookup evolutions and testing the ease of operation, etc. The Chimney Snuffer kit comes in a canvas carry-bag that has hand grips and a shoulder strap that provide easy storage and a grab-and-go ability. 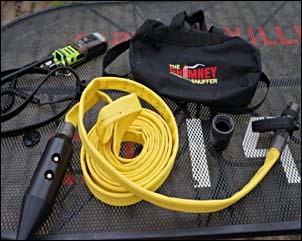 The kit includes a shutoff valve, 1" and 1-½" adapter connections, 25 ft. of rubber forestry hose that is resistant to embers, and a specialized broken-stream chimney nozzle. Before we did any evolutions with the device, we checked out the ability to adapt different water supply sources to it. 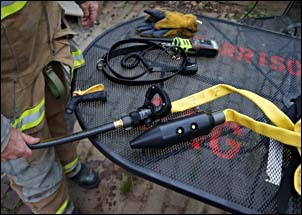 Since just about every home has a "green line" (garden hose), we gave that a try with the provided adapter and it was a very suitable fit, providing a low pressure and low flow alternative for the engine company. 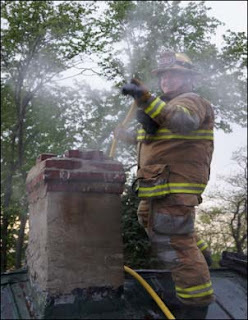 This would probably be the most-often used method of extinguishment. We also found the 1-½" adapter to be quickly and easily deployed when a greater volume and pressure would be required. However, TFT recommends a 40-gal. per hour flow at 60 psi. 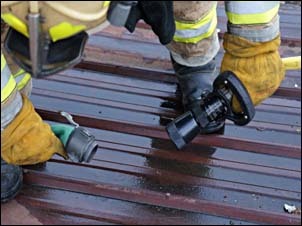 The nozzle gives out a broken, misty stream through several openings and is designed to be lowered down the chimney. According to the manufacturer, the torpedo shaped head is heavy enough to break through creosote buildup, bird nests or other common chimney obstructions and will provide a limited amount of water directly on the burning components, without creating extensive damage or thermal imbalance to crack ceramic tiles. With the remote shutoff valve, you can delay water application until you get it positioned in the burning area of the chimney. It will be interesting to see how efficiently it performs at an actual fire. Overall, The Chimney Snuffer kit is a great idea. Stafford County Fire & Rescue Dept. Interested in purchasing the Chimney Snuffer Kit or seeing more detailed specs? Click here to go to our website.